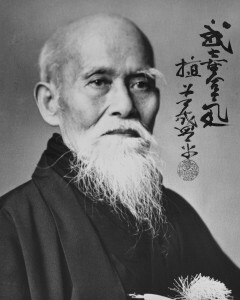 O Sensei, Morehei Ueshiba, Aikido founder, is said to have referred to four levels of development in students of Aikido. The description of these levels of O Sensei was explained in a book called Michi no shiori (“The Guidebook to the Way” or “Divine Signposts”) by Deguchi Onisaburo, O-Sensei’s spiritual teacher in the Omotokyo religion. When I first came across the above translation of the levels in a book by William Gleason several years ago, a flash of recognition came to me although I had never seen them before. It just made sense to me. Not being literate in Japanese, my reliance on translation further compounds the difficulty of truly understanding what O Sensei was talking about. Yet, while the language can certainly be an impediment, it’s not the only one. For example, even if I understood the Japanese words, I wouldn’t know where to start looking for the “Floating Bridge of Heaven” which O Sensei mentioned numerous times in his lectures. He talked often of the need to stand there to fully experience Aikido. But assuming these levels are a reasonable translation of O Sensei’s teachings, the concept has helped me and I’d like to share it. Besides, modern constructivism in educational theory holds that no matter how didactically and factually a concept is introduced, the learners acquire it through their own filter anyway, a filter informed by one’s life experiences. … people tend to get a headache when told to relax. Even “swing up” is challengingly ambiguous. This is the filter of my life applied to O Sensei’s teachings. In some ways though, it is inevitably like an attempt by a blind man to describe an elephant after having felt only its tail. Part of the brilliance of Aikido as a training regimen is that no discussion is necessary for the levels to unfold and reveal themselves to the student. Not even an awareness of the existence of any levels is required for the student to experience them. Nonetheless, as a recovering engineer myself, I recognize that there are among us, some left-brain, linear thinking, yang types of people who have a need to talk about their training and put the bits learned into neat conceptual boxes. Of course, Aikido learning is holistic and development occurs naturally on all levels simultaneously, but some of us need a more linear description of our progress. An oversimplification, you might say, but it’s not really. Let’s call it a very basic discussion. Hopefully this basic discussion will resonate with the experiences of a certain type of learner and help to lead them to that place where no discussion is necessary. Power is the balanced strength within each student. The engineer might call it the “Newtonian physics” of the interaction. Muscle mass, bone density, center of gravity, these factors are easily understood by all students. Big people tend to be stronger than little people. A person with large muscles and a low center of gravity can push a stalled car more easily than a really tall willowy person with skinny legs.That sumo wrestlers would be good pushers but not particularly suited to playing pro basketball, for example, is intuitively obvious to most people. Power is different from the “strength” that beginning students are often told not to use in Aikido. Muscle strength is a sub-set of power. Muscle strength is used to apply power, but not everyone with muscle strength develops real power. The above would be quite a mouthful to recite at every training session, so understandably, many have come to rely on the shorthand phrase, “Don’t use strength.” The ability to sum up the power in all of your body and maximize it in a balanced and focused way is the essence of this level. People with focused power can also do useful things… like driving a 16-penny nail into a pine stud with two or three hammer blows. Usually, it seems, the act of practicing to find your power results in an increase in power as well. That’s just good luck. Breath and its use in applying power is important enough to mention early but certainly not so simple that it can be dismissed as just another way to focus strength. Breath power or kokyu-ryoku is mentioned throughout the writings and teachings of the Founder and many Aikido masters. Tamura Sensei, the late shihan from France, wrote that irimi implies an exhalation and tenkan implies an inhalation. Akira Tohei Shihan taught that it was an important goal to accomplish complete movements in one breath, but despite 20 years of study with him, he never really explained to me why. I’m clueless about how to translate that into a practical recipe for study by left-brained people, and it certainly shouldn’t be expected to be understood in the first level. A discussion of breath power in this context could too easily settle into the oversimplification that breath power simply means focused power, but that’s better than not mentioning it at all. Akira Tohei Sensei answered many questions about such ephemeral subjects as kokyu- ryoku in this way. He instructed students to practice a technique 10,000 times and then ask again. Sometimes he would say that the men had to practice until their beards were grey before asking again. Let’s put breath power in that category, something to bring up again after you’ve tried to practice kokyu-nage and kokyu-ho 10,000 times. Aikido technique in its simplest form, I believe, is the ability to apply your power to the most vulnerable points on another body. The biomechanics of the human body impose certain realities on any interaction. It is easier to move someone’s hand if it is held out away from their body, and harder if it is clutched close to their chest. In my observations, for the first several years of Aikido training the majority of the “aha” moments have to do with the discovery of new and unusual biophysical quirks that reveal a connection to your partner’s center not previously evident. This can range from a simple leveraged elbow in ikkyo to the ever-popular discovery of the radial nerve in yonkyo. Pain doesn’t need to be the goal of these techniques, but pain can be an effective language to communicate the intention of nage to uke. The ability to apply pain in a myriad of fashions through mechanical advantage points does hold a certain fascination. While there’s nothing wrong with knowing seventeen ways to bend a person’s little finger until they say, “ouch”, I have found it can be a sidetrack to “the way.” Regrettably, effective technique does not seem to guarantee good Aikido. As another aside, the often-used instruction to “swing up” caused me a lot of confusion in my early training. Bio-mechanically speaking, “swing up” seems a lot more like the “clean” in weightlifting’s “clean and jerk” than it is to any swinging motion. The act of swinging an arm seems to rely heavily on the topside arm muscles, the anterior deltoid and biceps, which is not the goal. Whereas, the extension of the te katana in kokyu ho seems to be more of an extension of the underside muscles; a trapezius shrug followed by a triceps thrust and on down thru the back and gluteal muscles to the ground. To me, “Push up”, would be a more accurate direction. O Sensei, I am told, didn’t typically use any of the current terminology to describe the movements or techniques of Aikido. It was his son, Kisshomaru Ueshiba, Second Doshu, who oversaw the codification of the nomenclature we mostly use today. Nonetheless, the naming still provides some insight into the techniques. 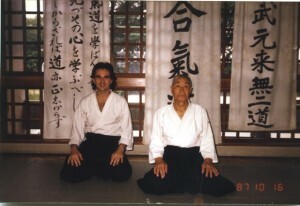 Rinjiro Shirata Sensei wrote that during his first three years of training with O Sensei, he was only allowed to practice two techniques; shomen uchi ikkyo (suwari waza) and shiho nage. So, the rationale behind naming something ikkyo or “first technique” might have had something to do with how it ranked in order of importance in O Sensei’s instruction. For the dogmatists still lamenting the various name changes, like, for example, from irimi-tenkan to omote-ura, or the change from kokyu dosa to kokyu ho, remember, if you can, that Brachiosaurus was called a Brontosaurus for a hundred years. We’ll get over it. Why do we practice two forms of most techniques? It’s a question not often answered to the satisfaction of most engineers. Omote and ura techniques, previously called irimi and tenkan are conspicuous learning blocks to mechanistic types. Tamura Sensei writes in his book Aikido that the terms omote and ura were only used to facilitate instruction and have no application for senior students. The Rev. Dr. Taitetsu Unno Sensei, a distinguished Buddhist scholar and early student of Akira Tohei Sensei, answered that question with the observation that perhaps we explore the outer extremes of movement to more clearly demonstrate where the middle lies. A beautiful answer but somewhat vague. Hayato Osawa Sensei gave a little more practical insight when he responded that the short answer is, “Ura is what you do when you can’t do omote.” He pointed out that we didn’t have time for the long answer. It was only a one-week summer camp. The biophysics of omote-ura can be analogized to the act of pushing a child in a swing. No matter how strong you might be, the most efficient application of force is additive to the direction of the swing. If the swing is coming towards you, pulling is additive. If the swing is going away, pushing is additive. The earlier use of the terms irimi-tenkan or entering-turning was, to me, a more explicit description of this assertion-compliance duet than omote-ura, front-back. However, when Akira Tohei Sensei returned from a technical committee meeting in Tokyo in the late 70’s or early 80’s, he announced that irimi-tenkan was now called omote-ura. We got over it. The training impediment here, for me and others I have observed, comes from the common practice of doing omote and ura in sets of two each regardless of the way uke presents the force of the attack. Engineers have a problem with this, as do transplants from other competitive martial arts like boxing, fencing or wrestling. Much of the instruction in such cases is devoted to getting a technique to work even if the attack really doesn’t call for that defense. If you want to practice, for example, ura waza and uke is a bump on a log or giving a pulling energy, you often have to devote the first part of your motion to getting uke to move, and to give you a movement that approximates an attack that would require an ura response. As a result, the beginning student is often asked to perform motions that are counterintuitive from a sparring standpoint. The early focus is much more on learning the steps involved in the technique than on applying any real defensive tactics. There arises the urge to describe the ideal uke as one always giving an attack which would be perfectly countered by the technique being practiced. Otherwise the defense is illogical. However, this “ideal” uke would rob us of the valuable training situation wherein we can practice patience, understanding and the ability to overcome anger, frustration and patronizing superiority. Blaming a bad uke for preventing you from learning Aikido is like teachers blaming their students for not learning. There is benefit too in training against the “wrong” attack. The lesson here is that there is something to be learned from every training interaction. Remember however, that sometimes the lesson to be learned is that “in freestyle” you would simply never use this technique against that attack. Learning when a defense won’t work is also a good lesson. Besides, Aikido can’t be “used” on anyone but yourself. It is a training method, or way, to learn the power of harmonious action. Boxers don’t “use” a jump rope in the ring, that doesn’t mean that jumping rope is not an effective way to train. These skills can then be taken into life to apply as desired. The best real-life Aikido “street stories” are, to me, when nothing happened. A recurrent question in class asks about the defensive-only nature of Aikido. We have probably all heard some version of the old joke about the Aikidoist who couldn’t defend himself against a mugger because the attacker didn’t grab his wrist. Can an ethical Aikido student initiate an attack? Remember at the same time that the ultimate goal is not to vanquish an aggressor, but to calm them until they realize their error in disrupting the tranquil fabric of the universe. Another mystical digression, to be sure, but there is also a utilitarian aspect to this philosophy. An ethical person might have time-consuming reservations about applying deadly force even in their own defense. Milliseconds count in a fracas. The first blow is rarely announced, more typically the initial opening is created by treachery, stealth or deception. A quick response is key, and having a goal of calming an aggressor can be psychologically more freeing than stopping to decide whether or not to possibly hurt another person. “More free to react” is code talk for quicker. But this level is about technique, so the traditional budo training concepts of sen no sen and go no sen, which are still taught in Aikido, might help the discussion. They refer to different timings of a response to an attack. In a very superficial description, sen no sen (before the before) describes a defense which blends with the earliest initiation of an attack and go no sen (after the before) blends with or receives the attack after it is more fully developed. They both seem to be reacting to some action by uke. In Secret Teachings of Aikido, O Sensei says that the old concepts of sen no sen and go no sen are rendered moot by Aikido in advanced form. He talks of the need in Aikido to react to the merest formation of the intention of aggression. In one of the earliest transcriptions of his teachings, Budo Renshu (Budo Training, more recently translated as Budo Training in Aikido), O Sensei sometimes shows uke striking first, and sometimes states that nage initiates the movement. This is most clearly shown in shomen uchi ikkyo, where the raised arm of uke is a defensive block and not a strike. Does initiation of movement make the action offensive instead of defensive? There is a longer form of this discussion which could add sen and sen sen no sen. Certainly some martial artists would argue that O Sensei’s advice to react to the intention of aggression is covered by sen sen no sen, but O Sensei seemed to be saying that his instruction somehow transcended that as well. Akira Tohei Sensei also taught that the attack began with the first intention of aggression and therefore any action taken to prevent that aggression was defensive, regardless of the actual timing of the movement. That is the stance I have taken in my training. To end this section on technique, it should be mentioned that accomplished technique is also one of the several languages used in the next level to communicate with uke that resistance is futile. What is the distinction which allows a movement to transcend bio-physics and attain the level of psycho-physics? I think it is the blending of not just the physical movement, but also the blending of the intention and will. The ability to convince someone that falling is a good idea rather than wrestling them to the ground. Many years ago, while on an Aikido pilgrimage to Yamagata, Japan, I had the pleasure of being “thrown” to the mat by Rinjiro Shirata Sensei, the venerable contemporary of O Sensei. I was taken down to the mat by a movement that doesn’t have a real “technique” name. If pressed to name the movement, it would be something vague like, ai hanmi katate tori kokyu nage. But in reality, Shirata Sensei wordlessly entered my personal space with an arm thrust that made me respond instinctively with a defensive grab of his wrist. He then sort of settled downward and backward with an exhalation of breath and I ended up on the ground. While still in the supine position, I recognized that I didn’t really have to fall, because he really hadn’t thrown me; he had somehow convinced me to fall. My subconscious had decided that falling was my best option. Now for you skeptics, this wasn’t a situation where I “knew” my role as use and compliantly went with the program. It was not in a formal class, and I had no idea what Shirata Sensei had in store for me. Also, on the other end of the “magic” scale, there was no bright light or encirclement of ki energy flowing from him either – at least none that I could detect. Yes, of course, there was the larger context in which I was a shodan from Chicago being shown incredible insights into Shirata Sensei’s training milieu solely on the merits of his relationship with my teacher. When it hit me that I had just experienced an Aikido “epiphany,” I asked Shirata Sensei, through our interpreter, if he would teach me that technique. I can still today hear his belly laugh, as he explained to me that I was much too young to learn that. P.S. – I was already in my 40’s. Around my second decade of training, the “aha” moments tended to be examples of a response to an implied force rather than a “real” application of power. These are the times when you get someone to move where you want them to go by threatening or luring, making them believe that the attack is working and they should keep trying, until it is too late. Deception, if you wish to call it that, a feint. If you communicate that an inevitable, unstoppable act is about to occur, and that resistance is futile, most people will react before it actually occurs. That reaction can be predicted. It’s not easy to predict and people all respond differently, but after thousands of repetitions with hundreds of different uke, certain patterns emerge. This is a powerful way to control another person’s behavior, and it makes physical strength irrelevant. The corollary situation as uke is to move away from and yield to any applied force before its full energy actually touches you. The strength of an attacker who can’t find a target is also irrelevant. Agatsu is hard for engineers. In its simplest form, this communication takes advantage of the flinch response, or the blink response. These are programmed into us by nature. Move too fast towards someone’s eye and you will hit it. Move too slowly toward the eye and they will just move away. Move at just the right speed and they will blink. That’s useful if your intention is to get them to blink. Harmony is agatsu, victory over self, using the non-linear right brain. Agatsu is hard for engineers. Integral to the psychology of this stage is the further communication that while resistance is futile, there is a way out, but only one. While it might be momentarily satisfying to see the panic in an opponent’s eyes if no way out is offered, fear and adrenalin induced irrationality might result. If more than one escape is offered, the incorrect impression is given to uke that the interaction is still within their control. Aikido doesn’t train fighting, but as Yamada Sensei often reminds his students, it’s still a martial art. That origin dictates some of the basics. Bonsai is not gardening, but you still water the little tree. Bonsai isn’t gardening, but you still water the little tree. The harnessing of this level is so exhilarating that it leaves me with the nagging notion that too much delight derived from the psycho trickery part of Aikido might inhibit the progression to the final level. Maybe it’s true that too much fun will retard enlightenment, but I think that some fun is probably okay. As I’ve said, knocking someone down, no matter how powerfully, is not as compelling as convincing them subliminally to fall down. In fact, if a movement feels particularly powerful to the nage, it probably isn’t. The sensation of power requires resistance, whereas a truly powerful move is directed to where there is little or no resistance. Akira Tohei Sensei said, in one of his between-class discussion groups, “Those who have been thrown by O-Sensei can never forget the feeling and the wonder at ending up on the floor without knowing how they got there.” Tohei Sensei certainly could apply power, as anyone who has ever been thrown by him can testify. Nevertheless, any attempt to use force to resist his throw left you with the unsatisfying feeling that you had tried to grab a puff of smoke. If a movement feels particularly powerful, it probably isn’t. Sometimes I feel as if I spent the first 10 years of my training learning to develop power, and the next 20 years learning how to not use it. The late Kisaburu Osawa Sensei was renowned for his “ki no nagare” or “flowing ki style” of Aikido. Jo Birdsong Sensei from Austin, Texas tells the story that Osawa Sensei explained to him that he wished he had started developing the soft style earlier in his career. He said that it was much more difficult to master than the hard style he studied in his youth and he would have liked more time to develop it. As a beginning student, I watched in awe as Kisaburu Osawa Sensei demonstrated his “one finger” ikkyo and other seemingly effortless techniques in our dojo. However subtle and powerful, ki no nagare was sometimes jokingly called an old man’s style. Now that I find the passing decades limiting my available resources, I think I more clearly understand the power of ki no nagare. As a younger man however, I wasn’t ready to exercise the discipline it requires. Another look at ki no nagare might show it as the shortest distance between two points. But, as any tourist knows, there can be side benefits to expending extra energy to get off the beaten path. Hurling uke halfway across the mat just to see if you can do it, and they can take it, does have it’s own training benefits, even though it takes extra force. Hard practice might be worth the extra effort simply for the insights into oneself that it provides. The question of “hard” versus “soft” training can go on forever and each person probably needs to balance it for themselves. An engineer however, even a young one, would do well to regard ki no nagare as at least… highly efficient. What is the way to oneness with all creation? With the attainment of complete self-mastery and harmony as a result of the diligent practice of the other three levels, the complete integration of one’s being and the universe is possible. Oneness is eternal. Aggression is a disruption of the fabric of the universe. Victory against disruption is instantaneous. However, since this is being represented as a practical discussion, my counsel in seeking this answer, is to practice modeling a universe of perfection 10,000 times… and then ask the question again.